The 9/11 Memorial and Museum’s official tour explores the 9/11 attacks and their legacy through the architecture and design of the World Trade Center. Beginning with an overview of the site’s history and an account of the attacks, this exclusive program examines how the World Trade Center was rebuilt and offers extraordinary insights and access into the creation of the memorial and museum. Led by staff from the museum, this is the only available tour of both the 9/11 Memorial and Museum. The experience lasts 90 minutes, and ends in the Museum, leaving participants to continue exploring on their own. Price includes Museum admission. Meet the 9/11 Memorial Museum staff member on the 9/11 Memorial between the two pools at 8:45 a.m. The tour leaves promptly from the silver tour cart at 9 a.m. 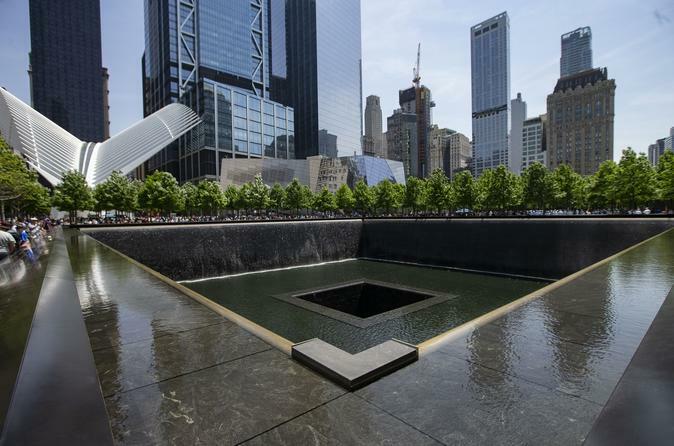 The guide will first highlight the history and design of the Memorial and the surrounding buildings, including 1 World Trade Center and the Calatrava Transportation hub, before heading inside past the crowds through a lane dedicated for tour participants. The tour will continue inside the museum, highlighting the actual archeological remnants of the World Trade Center and sharing the behind-the-scenes decisions that were made to create the 110,000 square foot institution. The tour includes Museum admission – stay and explore on your own following the tour.